Anne Goly Leong, 86, of Cranston, RI, passed peacefully Wednesday August 27, 2014 at Rhode Island Hospital. Born a daughter of the late Goly Yen and Hom Shee Ma, she had lived in Cranston for 58 years. 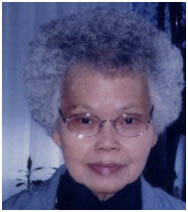 Mrs. Leong was the wife of the late Fook J. Leong for 56 years. Mrs. Leong was the owner, with her husband, of the former Cathay Den Restauant on Reservoir Avenue for 17 years before retiring in 1972. She leaves a daughter Deborah J. Leong and a son Daniel Leong both of Cranston. She was sister of the late Ida Lee, May Chin, Thelet Ning Yee and Tommy Yee. Her life will be celebrated with calling hours Tuesday 4-6pm with a funeral service Wednesday at 10:00am in the Stapleton Family Funeral Home, 684 Park Avenue, Cranston, RI. Burial will be in Pawtuxet Memoral Park Warwick, RI.